You may have started your own business, at least in part, to escape the cubicle jungle. But home-based business owners tend to learn quickly that there really is something to the notion of a dedicated workspace. A well-laid-out, efficient work environment pays off whether you're running a startup from your living room or are part of the mobile work force. Why? You spend so much time working in this space that enormous efficiency gains can lay in how it's organized. An optimal environment reduces eye and arm fatigue, improves concentration and can help extend the work day. To speed the return on your investment in home-office furnishings -- and to keep you from aimlessly cruising the aisles at Staples or OfficeMax -- we spent the past few weeks exploring some of the hidden corners of the higher-end home-office furniture market. Here are our picks for the right mix for functionality, character and efficiency for your home workspace. 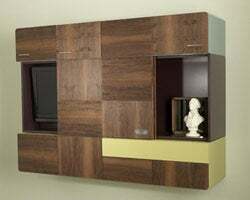 Note: Many of these items are available only through interior designers, either those accredited by an organization like the International Interior Design Association or decorators with large enough practices to have the clout to deal directly with high-end furniture vendors. So pricing can vary heavily depending on which sales channel you use. Be prepared to negotiate. The International Interior Design Association offers a convenient database of interior design resources that can help you find a solution closest to you. If you don't have a spare room to devote to your business, you might be able to surrender half of a room, or at least a quarter. In that case, an office partition is the best way to draw a line between your personal and professional lives. The USM Display from USM Modular Furniture is a modern-looking partition system that's also portable. This amounts to a movable yet solid wall that can be rolled away at the end of the day or into whatever configuration suits your purposes. It has some additional conveniences as well, including customizable surfaces such as a magnetic white board that can be used for any number of brainstorms and notes, as well as several attachable shelves. In small offices the white board can also double as a presentation surface for meetings. Either way, USM can make the divide-and-conquer strategy for the home office a whole lot more winnable. The desk is the centerpiece of any home office, but that doesn't mean it should take up the entire room. Belgian furniture maker Bulo has a deep line of compact desks in its M2 collection, so named for its one-square-meter shape. The desk, which comes in multiple colors, features a worktable which is attached to and extends sideways from a simple storage unit. It's big enough for a desktop, but also can be used as a multipurpose work area. Note: If the desk feels cramped it's for a reason. Research shows that a small desk forces workers to keep it clutter free. Which helps keep your office clutter free. The M2 line also comes with some well-made complementary shelving options as well as filing cabinets, and the set as a whole looks and feels professional. The desk also comes with an ergonomic footrest. If you have a small office, keeping the desk small can pay off. Your business can accumulate stuff just like you do, which means you never have enough storage. If style is important, one quirky but cool-looking solution is the TV Quilt, a giant wall-storage unit. It's got a patchwork look, but the various cabinets fit together like a puzzle, which is where the name comes from. The TV Quilt is a good way to store lots of stuff in style, especially if you're working out of a small space. Note that the unit does not touch the floor, which keeps tiny rooms roomy. We liked the variety of compartments that can be used to store a printer, or books, or file drawers, you name it. The insides of the shelves are also color-coded for organization: Work stuff might go in the blue one. Personal stuff in the white. We found this darn useful in keeping the office and the home from bleeding together. Just because you've carved out your perfect idea cave, doesn't mean it should be lit like one. 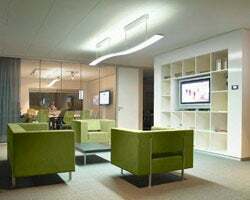 Effective lighting for your business lair is a must for keeping your eyes fresh and your mind alert. 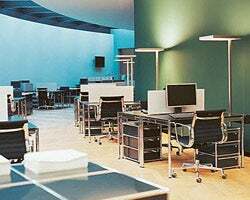 Under the Lightolier brand, Philips makes a full range of LED home-office lighting offerings -- ranging from task lights to overhead lamps -- that should meet whatever your illumination needs might be. In our experience, it's best to avoid direct, down-facing lights, which can tire your eyes and create energy-sucking computer glare. Lightolier's Halley task lights have a unique rotating head that can be moved in just about any direction, letting you bounce light off the ceiling or the wall to take the edge off even as you work late into the night. And they're equipped with dimmers, which can be handy for giving your eyes a break. Plus, the unit is cool and energy efficient. The energy-efficient LED bulb should let you keep your workspace lit with no hit to your power bill and with minimal increased heat.